Here at Modular we pride ourselves on our background in traditional window cleaning techniques. Quite simply, Bucket, Mop, Blade & Scrim.. This is what we do & We Do It Well. For more inaccesible windows we have a variety of techniques to accomodate a variety of situations. 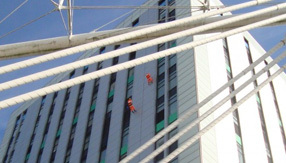 Windows, upto 7 stories (65 Feet)up can be accomodated with our water fed 'Reach n Wash' cleaning system. Windows higher than 7 stories, canopies and high access situations can be addressed via Scissor Lifts, Cherry Picker, Platform or Rope Access. We pride ourselves on saying, there is not a Part of a Structure that we cant clean. 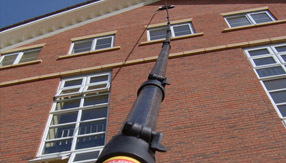 We pride ourselves on our ability to serve our customers needs whether commercial premises clients or domestic property clients,ALL are treated with the same level of importance and are given the same quality customer service, NO JOB IS TOO SMALL. We provide a professional job at affordable and competitive prices. Anti bird netting is a popular bird control service to protect urban buildings & structures from nuisance birds. Bird Spikes prevent pest birds from being able to land on linear surfaces including ledges, cornicing, ridges, parapets and window ledges. Bird Spikes can also be used on pipes casement window frames and rainwater gutters. Tired of annoying Graffiti Damage to your property? Well now there’s a way to fight back and restore your damaged property back to it’s original condition. Our Graffiti Removal Service is one of the quickest and safest graffiti removal services available in the UK.